because someone asked, and asked nicely. i'm an odd sports fan. not being adept at anything athletic, i have i general disinterest in most things involving sports. i am only vaguely aware of the world of tennis, have a general disdain for the NBA, and cannot care less about football. but i am rabid about certain things: the barangay ginebra kings and their exploits in the PBA, the UP fighting maroons despite their luckless campaign in the UAAP, and any competition involving flag and country. i get thrilled reading about wesley so's conquests of higher-rated GMs, and get visibly affected by the loss of cecil mamiit and the RP team in the davis cup. but while the world pauses to watch manny pacquiao fight, i go about my life like nothing important is taking place: i ignore it completely. currently though, i haven't had much reason to be either thrilled or affected. the barangay ginebra kings has bowed out of the fiesta cup after that heart-breaking loss to alaska, and despite my wishes of good luck to willie miller a day before the important game five. and the UP fighting maroons men's basketball team is in the cellar in the rankings, yielding a season-turning game against the other doormat, the UE red warriors. i am not affected because i've nearly given up: at least on the MBT. wesley also recently lost a promising start in an international chess tournament, and the asian games isn't until a few months from now. nevertheless, sports figured prominently in my affairs recently, and it began with my first live PBA game, courtesy of my friend donna. she gave me a ticket and of course, i was obliged to cheer for her team, air21, in a game that they lost to eventual fiesta cup finalist alaska. it was held at the cuneta astrodome, an ugly box along roxas boulevard, which seems all ripe for a renovation. the coliseum was not filled to the rafters despite its small size. fans were scattered on the bleachers, and i could tell many of them had gotten in for free. 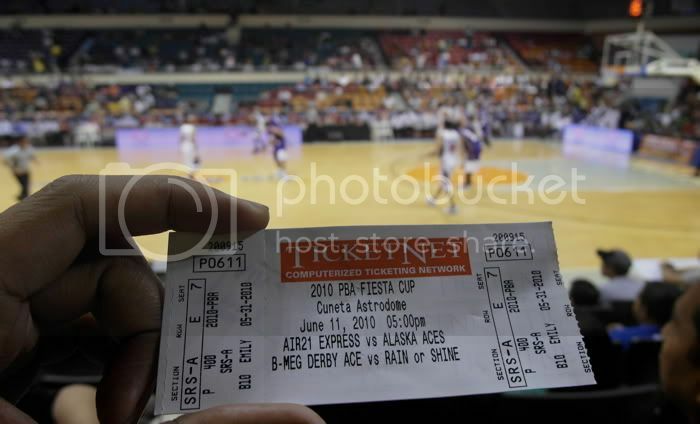 nevertheless, watching a PBA game live is something every serious sports fan should do. it's riveting in every imaginable way. the basketball players appear to be bigger than they actually are, and the court, smaller than it does on television. it's almost as if they don't have enough room to run around. the fans are also amusing to observe. i heard that some of them are regularly invited to watch the game, brandish banners and signs, and badmouth the players of the opposing team. that it gets personal between fans at odds is almost hilarious. and when you're there, you really do get carried away with a bad call, or a foul that isn't called, or a bad play. it's actually pretty exciting. i can't wait to see my next live game. hopefully it's ginebra, and i'm on ringside. and although i don't know much about football and despite my geeky inclinations, had no time to either study the teams and memorize the names of the players, i did see 3 games during the world cup: the quarterfinal match between argentina and germany, the semi-final that pitted the netherlands against uruguay, and the finals match of first time finalist spain and twice-runner-up the netherlands (i am geeky enough to actually look it up). like i previously mentioned, i have not developed a loyalty to a certain team. my support for portugal 4 years ago was pretty random, and this year, my decision to cheer for spain was equally whimsical, but is based on empirical reasons: i speak a smattering of spanish, some of my favorite colleagues at work are from spain, and they were ranked number 1 for over a year going into the tournament. and i'm glad i chose spain. 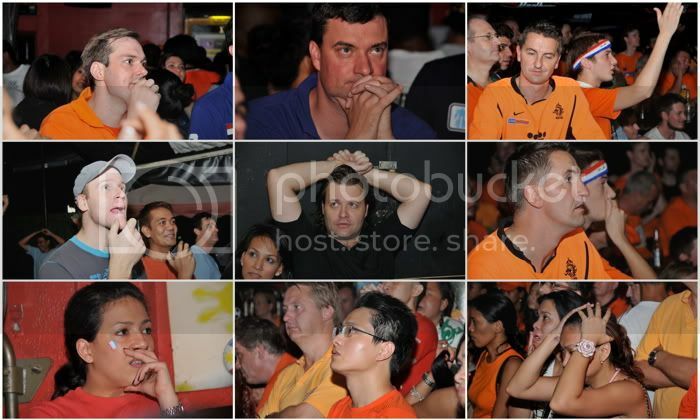 i watched the finals game at heckle and jeckle in polaris street, near makati's infamous red light district of p. burgos. why i decided to go there is lost on me when 20 other places in the same area had live screenings of the game, considering it is dutch territory: the bar is owned by a dutchman. however, handle bar was probably packed that morning (i heard they had to turn back some people), and other places were too sedated. 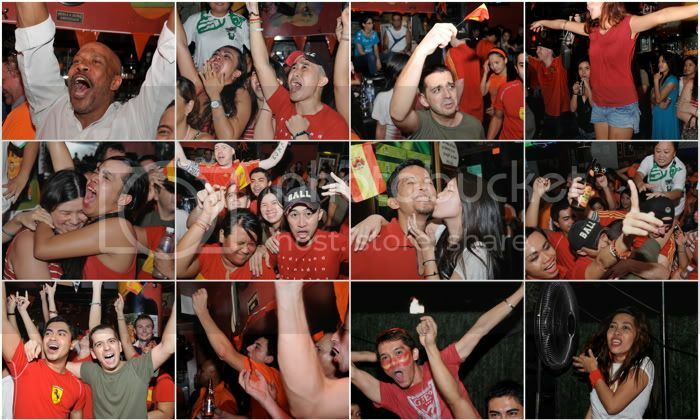 so i walked into enemy territory with my red shirt and my little flags of spain. surprisingly, there were other red shirted fans there too, although we were visibly outnumbered. we were a small pool of red in a sea of orange. the crowd was visibly hostile, particularly against us, in the friendliest of ways (if it is possible to be hostile and still friendly). i didn't know anyone there with the exception of mark from couchsurfing, but i had a grand time with complete strangers. and that's what the world cup does to people: you momentarily bond based on a shared love for a team, and you rejoice and celebrate when your team wins, or comfort and commiserate with each other when your club loses. i don't have to retell how the game went, but we were deliriously happy that our side won. the celebration spilled out of the bar and into the street. 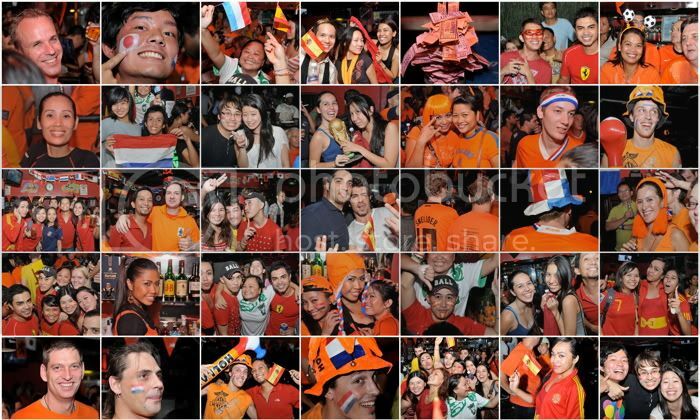 if the philippines were any more football crazy, there would have been a party and dancing on the street! but it was already late when the game ended. the sun was already about to rise when i decided to walk home from heckle and jeckle. i had given my flags to complete strangers who eventually added me on facebook because they were tagged on the pictures i posted. so here's to sports. if i can't myself do it, i might as well enjoy watching it.